My name is Jennifer Krebs, and I am an addict. My addiction is to racing greyhounds and advocating for them. The first time I saw a retired racing greyhound up close and personal was in 1993 in South Florida. I fell completely in love, but it was a full ten years before I realized my dream of adopting one. In 2003, I adopted my first greyhound, and my husband and I have adopted five more since. I spent the first five years of greyhound ‘parenthood’ primarily supporting adoption efforts. About a year and a half ago, that focus changed to working to end greyhound racing. For me, it was an evolution from supporting the Band-aid to supporting the cure. Dog racing is a cruel and inhumane sport. Over 20,000 greyhounds are bred to run for their lives every year. At dog tracks across the country, thousands of greyhounds languish in small, stacked cages inside dimly lit buildings, seeing the light of day only for brief periods of time when they are ‘turned out’ to relieve themselves. They are fed raw 4-D meat (‘D’ for dead, dying diseased or disabled), which contains denatured charcoal to discourage human consumption. Once or twice a week, they are taken to the track to race, where they face the chance of injury and death. They suffer broken legs, lacerations, paralysis, severed tails, cardiac arrest and heat stroke. Every day, the ‘careers’ of racing greyhounds end when they are no longer competitive, and their lives hang in the balance. Some of them are rescued by adoption organizations. Others meet an untimely end in any number of ways, of which euthanasia by a veterinarian is the most humane. Dog racing became a commercial enterprise in the United States in the 1920’s and it reached its peak in the 1980’s. Since then, dog racing has seen a steady decline, as public awareness of its cruelty has grown, along with competition from other forms of gambling. Dog racing is a dying industry. The market demand for dog racing shrinks each year, and now represents less than 1% of all wagers made annually in the U.S. In response, dog track promoters aggressively seek assistance from sympathetic politicians. This has led to some racetracks receiving direct subsidies. In other states, tracks have been given multiple tax breaks, special trust funds, and expanded gambling rights. More than anything, dog track promoters lobby for the right to install slot machines and other electronic gambling devices at their racetracks. Proposals to legalize slot machines at dog tracks almost always tie dog racing to slot machines, requiring by law that dogs continue to race as a platform for expanded gambling. Even though this marriage of two unrelated forms of gambling makes little sense, it is politically convenient. Dog track promoters can then argue for the legalization of slot machines as a way to save commercial dog racing. This year, I was extremely proud to join the Board of Directors of GREY2K USA. GREY2K USA is a national, non-profit organization of humane-minded citizens who work to pass stronger dog protection laws and close down existing greyhound racetracks. 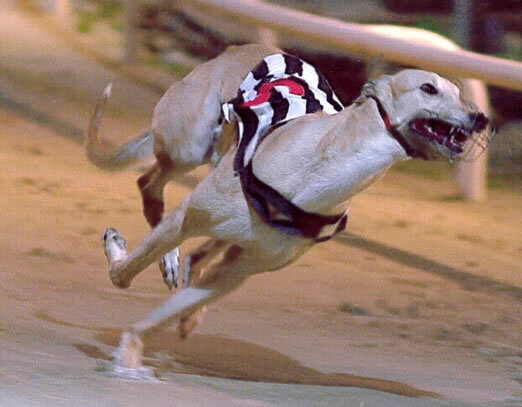 In November 2008, GREY2K USA became the first group to successfully close down dog tracks through the citizens’ initiative process, passing Massachusetts Ballot Question 3. Part of my work advocating for racing greyhounds is simply spreading the word about them and about the cruelty of dog racing. I’m honored by Professor Cassuto’s invitation to be a guest blogger on Animal Blawg, and I appreciate the opportunity to talk about greyhounds in a forum of people who understand the importance of speaking for those who don’t have a voice. I look forward to sharing more information and experiences with you in the future. Thank you, Jen for the greyt work you are doing on behalf of the Greyhounds! The planet needs more people like you who devote their lives to protecting these noble animals. Thank you for your commitment to such a wonderful cause. I too have a greyhound (she raced in Florida before I adopted her) and I am sure I will have more in the future. They are amazing dogs and do not deserve the disgusting and cruel treatment they receive in the industry. Please keep us posted with any progress! It was your excellent post about the Raynham Park closing that drew me to Animal Blawg, so thank you so much! I am so glad you’ve already adopted a retired racer. They are amazing, aren’t they? those hounds can really run fast can’t they?